Revenue in the Apparel market amounts to US$72,623m in 2019. The market is expected to grow annually by 2.3% (CAGR 2019-2023). The market's largest segment is the segment Women's & Girls' Apparel with a market volume of US$28,586m in 2019. In global comparison, most revenue is generated in United States (US$348,300m in 2019). In relation to total population figures, per person revenues of US$880.94 are generated in 2019. With a volume of more than 300 billion Euros the Clothes market is the most important non-food segment within the European retail sector. It comprises all clothing segments that are produced for private end customers. This market is broken down into the following product lines: Women’s Apparel, Men’s Apparel, Sportswear and Swimwear, Underwear, Hosiery and other clothes. Work clothes as well as other personal accessories such as watches and jewelry, handbags or similar items that do not count as actual articles of clothing are not included. The European clothing market is mostly based on imports. A noteworthy amount of actual producers can only be found in some Mediterranean countries (Spain, Italy) and Eastern Europe. The most important procurement countries are located in Asia (China, Vietnam and Bangladesh). Turkey, however, is also of significance in this regard. Nike, ZARA, H&M and Uniqlo are the most valuable fashion brands in the world. In addition, there are numerous small, middle-sized and big brands that operate successfully at a national or regional level. Along general lines, the distribution channels can be divided into stationary suppliers of multi-label products (department stores, traditional specialist shops), vertically integrated textile chains (e.g. H&M, Primark) and mail-order businesses (e-commerce, ordering by catalog). Furthermore, some fashion brands seek direct contact with their customers through single-label stores. The upswing in online shopping and the continuing expansion of the major textile chains leads to an increasing pressure on price levels in an ever-growing total market. Reading Support Revenue in the Apparel market amounts to US$72,623m in 2019. 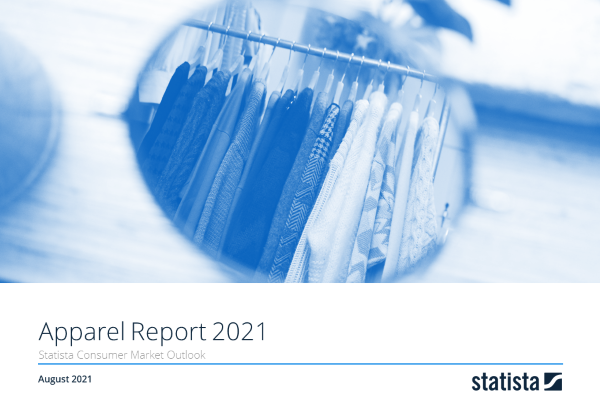 Reading Support The Apparel market is expected to show a revenue growth of 2.5% in 2020. Reading Support The average revenue per person in the market for Apparel amounts to US$880.94 in 2019. Reading Support In the market for Apparel, volume is expected to amount to 4,884 m pcs. by 2023. Reading Support The market for Apparel is expected to show a volume growth of 0.8% in 2020. Reading Support The average volume per person in the market for Apparel amounts to 57.83 pieces in 2019. Reading Support The average price per unit in the market for Apparel amounts to US$15.23 in 2019. Reading Support With a market volume of US$348,300m in 2019, most revenue is generated in United States. Here you can find more studies and statistics about "Apparel".